In the midst of last week’s action-packed vacation which included trips to an amusement park, miniature golf, driving go-carts and swimming at the pool, an old truth was brought back to mind. While they enjoyed all of those activities, what was one of my daughters’ favorite moments? 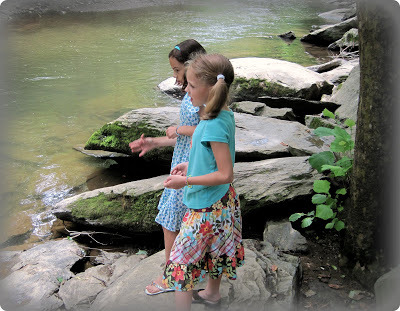 A stop at a roadside stream where they climbed over rocks and tried to skip small stones across the water. What a great reminder that it’s often the simple things that make great memories! Almost all of our days off include woods, streams, etc. It's been a long time since we've done any of that other stuff. More fun to just be together and exploring and playing together. Isn't that the way it always is? My son loves playing with cardboard boxes as much as the "real" toys that come in them! Thanks for stopping by my blog and leaving a comment. I'm always excited when I meet new blog friends. I plan to come back when I have some time to read some of the posts that have caught my eye. Love the message of this post. Yes, simple things sometimes are the most remembered rather than the elaborate theme park rides etc. 😀 Dh was helping ds to skip rocks when we were on vacation. They had a blast! Love it!! So glad to hear your back and had a great time! Lovely photo! Oh, and I love the new blog banner and changes ~ fun! What a sweet post and such a pretty photo!